The seller of today’s Nice Price or Crack Pipe Audi says he’s dropped his price. That’s always a good thing, but we’ll still need to see if this twin-turbo hauler has even farther to fall. They say you never forget your first time. First time of exactly what, I don’t know, as I seem to have forgotten. The first VW Jetta was pretty memorable, and yesterday’s seemingly well maintained and appreciably rare 1984 GLI edition seemed well worth the prospect of racking up some new memories. At $5,200, it came away with a decent 60-percent Nice Price win too. Seems like everything’s looking up for sporty German cars these days. If that’s really the case, then how about another, albeit far more rabid, son of a Deutsch? Here we have a 2001.5 Audi S4 Avant. And yes, that .5 is important, but we’ll get to that in a sec. The B5 S4 debuted in 1998, with U.S. sales commencing the following year. This was the first time the S4 badge was applied to the smaller B-class platform, as its Ur interpretation was based on the bigger C-series A6. At the time, the twin-turbo V6-powered B5 S4 was the quickest sedan in Audi’s stable. This one’s a longroof and comes in evil incarnate black over black over gunmetal grey wheels. The paint holds a shine, and it still carries its headlamp washer covers which is laudable. I can’t tell you how many old Audis I see running around with those missing. I mean, it’s been like two or three! On the downside, there appears to be some curb rash on the left front alloy and the headlights are foggier than Jeff Sessions’ memory, Both are pretty simple fixes, but will add to the car’s cost. The interior is in equally serviceable shape and proves that if there’s one thing Audi knows how to do, it’s interiors. The dash and center stack may lack the huge screens that are common today, but aside from that it looks both contemporary and classy, no mean feat for so old a car. Everything in here is said to work, including the short-lived display in the cluster, which has been replaced. The headliner is sagging as they do, and the driver’s seat shows some wear from fun time. Other than that throne all the leather looks good if strangely shiny. The fun time here is provided by the 2,671-cc V6 and six speed manual, which along with the Torsen center diff Quattro AWD offers up a pretty potent drivetrain package. The 251 horsepower 30-valve six comes with a turbo for each bank along with its companion intercooler. No, these are not the simplest nor cheapest engines to work on—you pretty much have to remove the entire nose of the car just to replace the thermostat—but then, anyone buying this car should already know that. The ad says that the front-of-the-engine work—timing belt, water pump and thermostat—has been recently done, so perhaps it’s good to go for another 100K. It already has 200,000 on the clock, which is not bad for an old Audi, and especially laudable for one that presents this cleanly. As we noted earlier, this is a two thousand and one point five model. Those are generally considered to be the ones built from September 2000 to June of 2001 and they feature numerous major upgrades from their earlier 2001 model year predecessors. Okay, so pretty much all they got a new S4 badge and a revised intake manifold. So sue me. Regardless, the .5 model year differentiator is notable to Audi aficionados, and now so should be to you as well. For the rest of us, this looks like a pretty quick hauler that, while chock full of miles, still seems to have plenty of life left in it owed to what seems to be a decent maintenance history. What could all that possibly be worth? The asking price is $6,500 which ain’t chump change for an old Audi. This one’s just old enough to get its learner’s permit and its seller has already dropped his asking to that $6,500 despite saying that he’s in no hurry to sell. What do you think, should he just wait it out at that price, or should he keep on dropping on? Das ist gut! C'est fantastique! 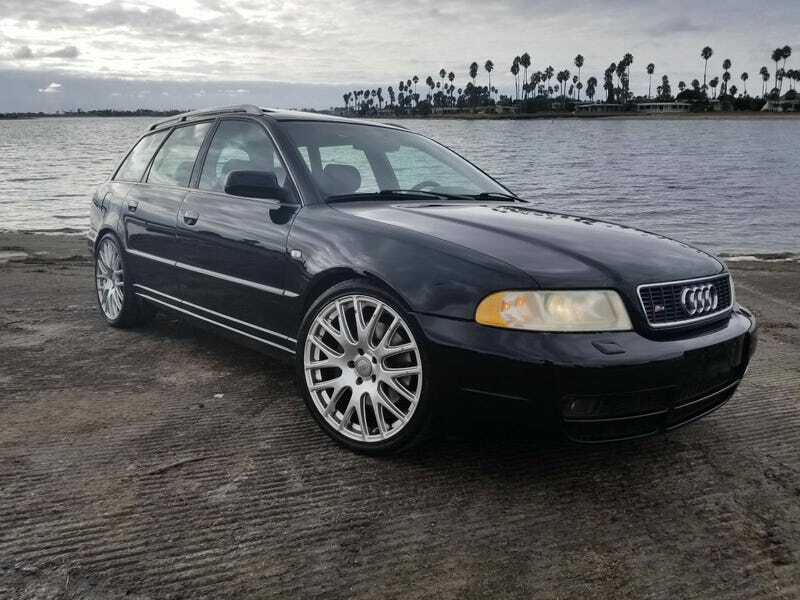 For $8,400, Does This 1995 Audi S6 Quattro Tempt?